Please select options for Proven Ground Raptor Style Fender Flares (15-17 F-150, Excluding Raptor) at the top of this page. Hey, what's going on guys? Adam here with americanmuscle.com. Today I'm bringing you a detailed review of the Barricade Raptor Style Fender Flares fitting all 2015 and newer F-150s. In this video, I'll be going over everything you can expect as far as functionality and styling with these fender flares from Barricade as well as the materials and construction. And I'll even take you through the installation which I'll tell you up front, will require a little bit of splicing, no drilling however, but I will be giving it a two out of three wrenches on our difficulty meter so let's jump right into it. 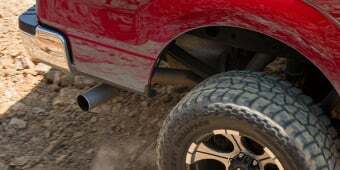 The Barricade Raptor Style Fender Flares will be for all 2015 and newer F-150 owners out there looking to increase their wheel and tire size and want to keep it street legal, want to protect their factory fender lips, and want to pick up the aggressive look of the SVT Raptor for their own F-150. 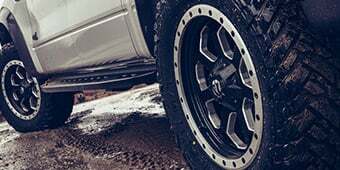 Now, it's a very popular upgrade to go with a bigger wheel and tire set up for your F-150, but unfortunately, when it extends past your factory fenders it becomes illegal for highway usage. When adding a set of fender flares like the ones I have today, you can add additional tire clearance to make it a street legal setup. 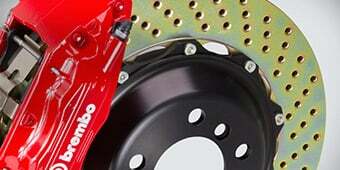 Now, in this case, you're getting two inches of additional tire clearance which may just be what you need. 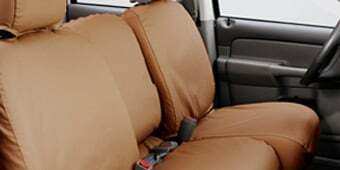 These are manufactured out of a durable UV treated ABS plastic with a slight textured black finish here. 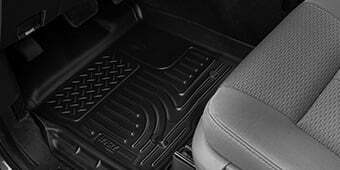 Great for on and off road usage and it'll actually protect your factory fender lips from small trail hazards and even door dings in the parking lot. In addition to adding a little bit of tire clearance for your bigger wheel and tire set up, with picking up these fender flares from Barricade you're also getting some more accent lighting for the side profile of your F-150. Amber high-powered LED lights will be included in the kit for you to install into each corner of the front fender flares and will be able to splice directly into your factory headlights to give you a running light for the sides of your truck. Now as far as how much additional tire clearance you will need for your particular wheel and tire setup will obviously be up to your personal preference. Now some options can go from two inches all the way up to four inches. Now this one here falls at the two-inch mark. Now moving along to the installation portion of the video, again, this one will be pretty straight forward. However, it will require a little bit of splicing on your end. 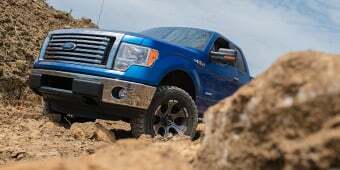 No drilling or modifications will be required, however, to the body of your F-150. Now this one will require a ratchet and a simple socket set and about an hour or two's worth of time in the driveway at home. Now, to kick things off, you'll be using the hardware provided for you in the kit in the factory mounting positions above each wheel well. Take each fender flare, put it into place. Bolt everything down using your ratchet and socket set, move along to the next fender flare, and you're good to go with the wiring. Now with the LEDs provided in the kit, you'll be able to feed those through into the holes provided for you on the front fender flares. Now when it comes to wiring them, they can be wired to any power source, but it's probably your easiest bet to run them up to your headlight harness and splice them in that way. Overall, again, I'd say about an hour or two depending on how familiar you are with the splicing process. This one, again, will take a two out of three wrenches on our difficulty meter because it does require that extra splicing step. Well guys, just to wrap things up here. If you are the owner of a 2015 or newer F-150 and you're looking for a way to pick up the aggression of the 2017 SVT Raptor with the Raptor styling, as well as protecting your factory fender lips and getting some additional tire clearance with for a bigger wheel and tire setup. You might want to check out the Barricade Raptor Style Fender Flares available right here at americanmuscle.com. SVT Raptor Inspired Styling. 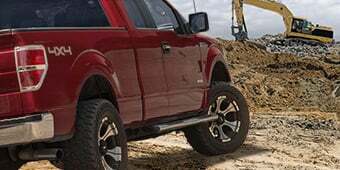 It doesn't matter if your F-150 is a daily driver or a dedicated work truck a set of Proven Ground Raptor Style Fender Flares is a great way to give your rig a much more aggressive off-road appearance. Styled after the rugged good looks of the Raptor, these Proven Ground Fender Flares not only add great eye catching appeal, but they are an excellent way to protect your rigs aluminum body from damage and scratches. Two Inches of Extra Tire Coverage. Not only do these Proven Ground Raptor Style Fender Flares look great on your F-150, but they also provide an additional 2 inches of tire coverage. These Fender Flares are ideal for F-150s that are running oversized wheel and tire packages on the street that need the extra coverage to stay within local law ordinances. Durable ABS Construction. Proven Ground manufactures their Raptor Style Fender Flares from an OEM quality acrylonitrile butadiene styrene (ABS) material. ABS is known for its light weight, superior durability and impact resistance making it the ideal material for use on and off road. Proven Ground then completes their Fender Flares in an OE-style dark charcoal textured finish that matches your F-150s existing factory trim. LED Accent Lighting. These Raptor Style Fender Flares include amber LED accents on the front two flares for additional safety. 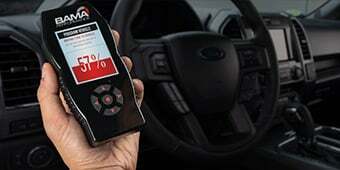 The LED Accents include a wiring harness that simply splices into your F-150's existing factory headlight harness. 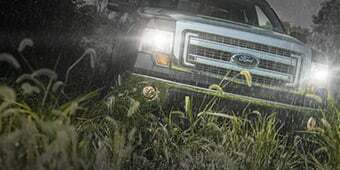 The LEDs will automatically activated in conjunction with your F-150's running lights. Easy No Drill Installation. Proven Ground engineered their Raptor Style Fender Flares to install using the existing factory holes located in the inner fender splash shields. Factory fender flares must be removed prior to installation. There is no drilling or modifications required for a clean simple installation. Installation can be completed in less than an hour with just basic hand tools and the supplied hardware. Application. These Proven Ground Raptor Style Fender Flares are specifically designed for use on 2015 to 2017 Ford F-150s, excluding Raptor models. Technical Note. 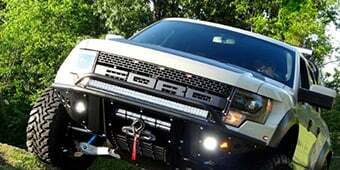 They are not compatible on F-150 models equipped with Technology Package 68T that includes lane-keeping sensors in the front fenders. Any chance these fit a 2018? Unfortunately they have not been confirmed to fit the 2018 models. I have a '16 F-150 with plastic OEM wheel liners and mud flaps installed currently. Will these fit with my current set up? Hello! Yes the Barricade Raptor Style Fender Flares will work with your current set up. These will not fit the 18 models due to a slightlydifferent body design. Does this affect 360 degree camera or blind spot information system on 2017 Platinum F150? No, these flares will not interfere with the 360-degree camera or blind spot systems. Hello, will i need to drill any holes to install these on my 2016 f150 with the chrome package without the factory oem fender flares? I know the sport trucks with the oem flares have instalation holes. Also can i attach the ford oem mudflaps made for trucks without flares to these fender flares? The Barricade Raptor Style Fender Flares are installed using the existing factory holes located in the inner fender splash shields. There is no drilling or modifications required for a clean simple installation. The Barricade Raptor Style Fender Flares will require you to remove the OEM flares for installation. The Barricade Raptor Style Fender Flares will provide approximately 2" of tire coverage for each tire. The Barricade Raptor Style Fender Flares are made of a Durable Automotive Grade ABS Material that can easily be layered with paint , dip, or vinyl wrap. Unfortunately these fender flares are not currently offered in a pre-painted finish. These will not fit the 18 models due to a slightly different body design. The Barricade Raptor Style Fender Flares will arrive in an OE finish Automotive Grade ABS Material, but they can be paint matched to your F150! A new version for the 2018 models will more than likely be released in the future. Unfortunately we have not received any information on when they will be available. These Barricade Raptor Style Fender Flares are specifically designed for use on 2015 to 2017 Ford F-150s, excluding Raptors. They look great, keep the dirt and grime off my truck. Can’t say how hard they were to install I had a body shop put them on. The lights are easy to wire up though. Just make sure you know what you’re doing before you start splicing into wires. Bends in fender don’t line up with body lines, which in turn leaves huge gaps, their pre drilled holes don’t line up with the bolt holes the instructions say to use. Worst fender flare I have ever tried to installed. Plus the pre drilled holes to mount the led lights didn’t even line up. These flares pair perfectly with the raptor grille. A real head turner everywhere I go!! These Barricade fender flares aren't as easy to install as lead to believe. Definitely need two people. No matter how I adjusted them I couldn't get one of the front and one back to fit tight against the fender. The other 2 fit great. I really feel thr two weren't bent enough. Other then this problem they are ok. I just don't care for a 3/8" gap between fender and flare. This gap doesn't go all around the flare though. Bought this kit knowing ahead of time that there was some quirkiness to the install. Some had complained about having to install the rubber gasket, which was not too bad but did take longer than the other steps. My kit came with instructions, and I also downloaded instructions. However, the installation clips and fasteners that came with my kit were different from both sets of instructions, to a point where I had no idea how to use them. I watched the video too, but no details here on how to use the clips. After messing with one flare for like an hour, I said screw it and made up my own method which went quickly and they are very secure. If you get them tight against the truck, the gaps are not too bad at the rockers. Had them on for about 2-1/2 months now and they are awesome, and have the perfect amount of flare I was looking for to match my wheel/tire offset. Lots of compliments too. Cant beat the price, but wish they had more consistency in the clips and more clarity on the installation. Maybe a more detailed video would be the best way? Painted them and then clearcoated them to make them look shiny smooth, cut and buffed them after the paint job, alot of work but they look good now.. Happy with the results. Lines match up really nice. Definitely need to remove wheels to help with install. Takes a bit longer than expected and make sure you have a 2nd person to assist at times. Easy and inexpensive way to cover the scratches and swirl marks commonly found on the door pillars. Fit is ok at best. LED lights better than expected. Install requires two people and took a couple deliveries to get the right parts shipped to me. Looks great until you get up close. They look great until you get up close. I had 4wheelparts install these and although the back fenders fit great, they pointed out that the front fenders don't line up. Not sure if I just got a bad batch of the product or the fitment doesn't really line up for my truck. I posted pictures in the pic section and you can see where the mold doesn't line up with the truck. The product you get for the money is awesome. The truck has only received compliments. Install was a little difficult on the front but onnce I got going it went fine. I had to remove factory mud flaps and so but no problem. I would feel better if you could 3M tape the top of flare to fender for fit and security. The do have alittle gap. Hopefully I never have a problem. Was going back and forth between the pocket flares and the raptor style. I feel I made the right choice, love them. Took longer than expected because I had to remove the stock fender flares and I didn't have any plastic removal tools. Aggressive look Ford f150 off-road look easy-to-installed. These flares are pretty decent especially when you look at the cost of some of the other brands. The install is fairly simple and the improved look is great. The fit is decent although there is a small amount of gap at some of the body curves. Overall not very noticeable. Good looking flares, great price but the installation was very tricky. Took about 4 hours to complete and there was still a small visible gap between the flares and the fender. Yeah, I was really looking forward to these but the bolts don't match up to the truck. I am a handy guy and will find a way to get them on but may have to do some drilling. I was hesitant to buy these at first, but so glad I did now! Totally changes the look of the truck. Not too much flare, covers my 33x12.50 MT tires perfectly. In the product pictures, it looked like the body lines were a bit off from the flares, but i can assure you these follow the body lines pretty close. The only thing Im a little disappointed in, is that the LED lights are almost a yellow color, and not the same deep amber as the grille lights in the Raptor Style Grille, which is made by the same company... gonna have to experiment with some amber tint to make it look the same as the grille lights. 4 STARS from me only because of the yellow LED lights not being more of an amber color. Level kit 22 inch hostile wheels barricade fender flares raptor style bumper and grille.